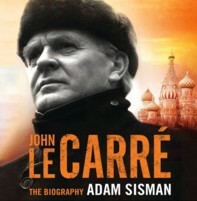 Hearing Adam Sisman talking about his biography of John le Carré on the Open Book podcast a few months ago was so fascinating that I was keen to read the book. I decided to listen to the audio book because it's read by Michael Jayston who has narrated so many of le Carré's novels over the years. I especially remember listening to The Constant Gardener, one of my favourite le Carré novels. I always see Jayston as Nicholas II (after his performance in the movie version of Robert K Massie's Nicholas and Alexandra) but his voice is perfect for this book. I found the interview with Adam Sisman so interesting because he talked about the process of writing the biography. Other biographers, including Robert Harris & Graham Lord, had proposed biographies of David Cornwell (le Carré's real name) in the past but his reluctance to reveal himself was a barrier. Sisman was able to interview Cornwell at great length during his research & always maintained that his book would be as objective as possible. Cornwell obviously trusted Sisman with more of his story than he had allowed anyone else although there were areas he refused to discuss. Most importantly, he refused to talk about his time as an agent & then agent runner for MI5 & MI6 in the 1960s. Sisman researched this part of the book through interviews with David's colleagues & archival research.Their relationship certainly never became cosy & only last week, I read this article in The Independent, about the sale of the film rights to the biography where Sisman reveals the ambivalence Cornwell felt about the book. It also reveals the essential canniness & business sense of Cornwell. The film rights in the biography have been sold to The Ink Factory, a company owned by two of Cornwell's sons (with seemingly a fair amount of input from the author) although Sisman had to pitch the project to them like any other writer. They also produced the recent adaptation of The Night Manager. David Cornwell's life was profoundly influenced by his unhappy childhood. His father, Ronnie, was a con man, a deceiver, womaniser & thief who was declared bankrupt several times & spent time in prison. David's mother, Olive, left her husband & her two sons, David & his older brother, Tony, when the boys were quite small. They had no contact with her for years & the grief of her departure had a devastating impact on the boys. Ronnie's career consisted of mad schemes, charming money out of just about everyone he ever met, setting up businesses that always paid him a generous salary but somehow never returned anything to his investors. He lived his life one step ahead of the law & sometimes tripped & ended up in court. He was a constant source of unwilling pride & of embarrassment to David who became adept at an early age at hiding his true feelings. He was sent to boarding school at Sherborne at a young age &, when he was just sixteen, decided to go to Berne alone to study German language & literature. He studied at Oxford, became a teacher, working at Eton, married his first wife, Ann, & began writing fiction. He was also recruited by MI5 & worked as a diplomat in Germany & Switzerland for several years. However, the publication of The Spy Who Came In From the Cold in 1963 was a turning point. He left the intelligence services & became a full-time writer. His name is indelibly associated with the great espionage novels of the Smiley series, Tinker, Tailor, Soldier, Spy, The Honourable Schoolboy & Smiley's People but his later novels have been just as successful, many of them being adapted for television & movies. I loved reading about the process of writing the novels, the research undertaken all over the world. Almost as interesting is the extent to which David (I feel as though I'm on first-name terms after these last weeks of wanting to get back into the car to listen to a bit more of what happened to David next) has mined elements of his own life & especially his relationship with his father in so many of the books. Ronnie appears most recognisably in A Perfect Spy, the most obviously autobiographical of the novels but relationships between fathers & sons are integral to several other novels & aspects of Ronnie, & of David himself, creep into many characters. I also enjoyed reading about the process of adapting the books to other media. Cornwell was involved in the scripts for several of the adaptations & there are wonderful stories about his time on the set of The Spy Who Came In From the Cold with Richard Burton (who hated the director & wanted Elizabeth Taylor to play the love interest), & the friendship that developed between David & Alec Guinness during the production of Tinker, Tailor, Soldier, Spy. It's also fascinating to see how his anger at corruption & injustice has grown over the years & is channelled into his fiction - American imperialism in The Tailor of Panama, the plight of the Palestinians in The Little Drummer Girl or the iniquities of big pharmaceutical companies in The Constant Gardener. Far from running out of topics to write about after the end of the Cold War (a suggestion that infuriates him), he has continued to find new villains to write about. If I have a criticism of the biography, it's that Sisman goes into almost exhaustive detail about everyone David has ever known or worked with. The book is very long (over 26 hours on audio so about 600pp) & it feels as though Sisman wanted us to appreciate the depth of his research. He also quotes far too many reviews of the books. I know he wasn't writing a literary appreciation of the work but fewer quotations would have made his point just as well. He does quote the stinkers as well as the raves. Essentially though, all Sisman's research can't really get to the depths of David Cornwell's character. For all his apparent openness in the interviews Sisman conducted, he has told so many versions of himself & his life to so many interviewers over the years that the truth is hard to discover. There seems to be more of Ronnie the obfuscator & conman in David than has ever been acknowledged. His years in MI5 & MI6 added extra layers to his character that have hardened over the years. We don't really see much of the family man (he has three sons with his first wife & another son with his second wife, Jane) but maybe that was a conscious decision by Sisman not to intrude on their lives. The Cornwells have lived in Cornwall for over 40 years & there are some lovely stories about his meticulous working habits, walking along the cliff paths, talking to himself as he plans his books. He rarely gets involved in the London literary scene, he almost seems to despise it, & doesn't seem interested in using his celebrity although he has been generous to various philanthropic causes. I was intrigued to read recently that, after many years of refusing to write a memoir or autobiography, Cornwell has written a memoir called The Pigeon Tunnel which will be published in the UK in September. Coming so soon after Sisman's biography, I wonder if it was prompted by the wish to put his own side of the story or if the process of remembering & telling Sisman his stories led to the desire to write about his life himself? Interestingly, The Pigeon Tunnel was the working title for several of his novels over the years so I wonder if he's planning to play another joke on his readers by promising to reveal more than he will actually deliver? The subtitle is A Writing Life so it may be more about the professional than the personal life. After reading this absorbing biography, I'm looking forward to finding out.